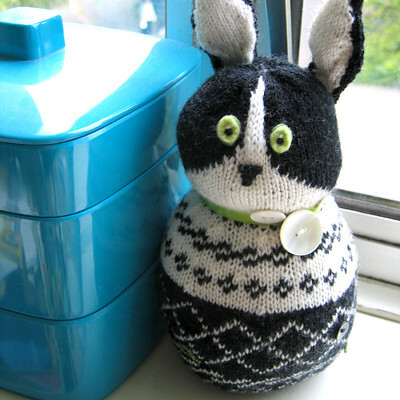 Here is my backtack offering – A startled rabbit! She’s made from Matchmaker 4ply, and knit in the round. I threaded the buttons onto the yarn before hand, so that I could knit them into place, like you do with beading. 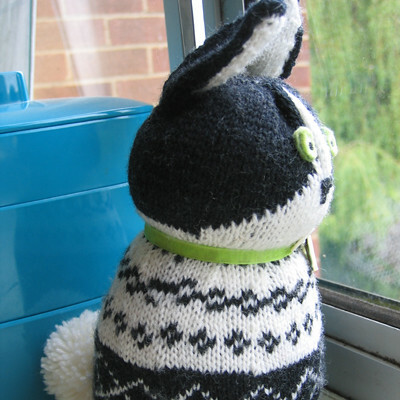 I wanted to keep to Wee Wonderful’s bunny pattern, but knit it rather than sew, which meant lots of measuring, and fiddling with the pattern as I went along, but overall I’m pretty happy with. In other swaps and challenges news, I’ve had to drop out of the Nectar Gallery ‘Wall of Yarn’ exhibition. I feel like a total jerk and hate letting people down, but everything I tried just looked terrible. You know sometimes an idea really works and you get into a really creative groove? And sometimes exactly the opposite happens and you wonder why you’re even trying in the first place? Well yeah I had one of those. I guess I figured doing something artistic, instead of useful and pretty was like riding a bike – even if you haven’t done it in years, you can just do it and it’ll be fine. But it’s obivously not, and with hindsight I feel a bit stupid for thinking it would be. It took years to earn my artistic skills and since I didn’t keep them up after university (or rather they morphed into something more practical) they are rusty now that i come back to them. I think maybe i need to back off the deadlined projects for a while? Either way I feel really bad. WOW! I am seriously impressed with your knitting abilities. This is one of the most creative and talented BT3 entries I’ve seen. Bravo! I second the “Wow!”. What a gorgeous and detailed bunny! She looks so incredibly soft and I love the buttons on her collar. Well done! I’m sure the recipient loved her! Oh my, what a wonderful bunny! Knitterly goodness.